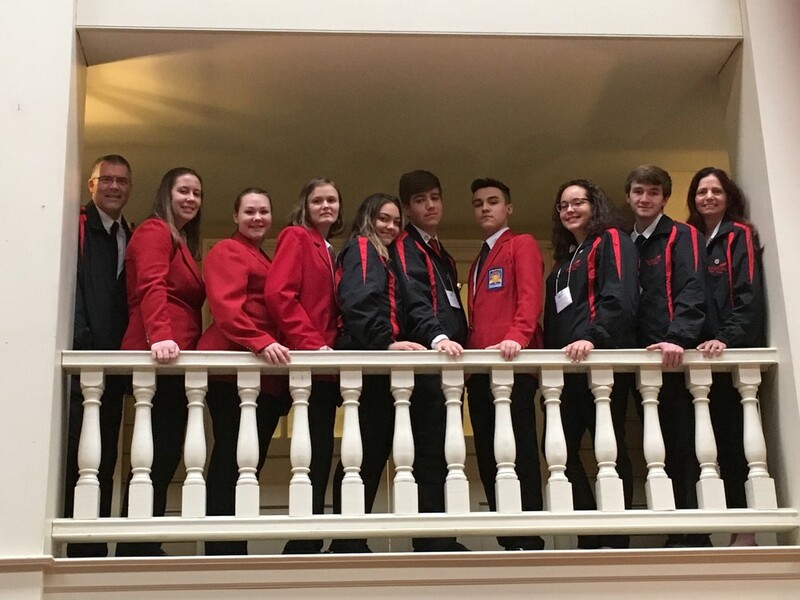 SkillsUSA members at Jefferson-Lewis BOCES had the opportunity to network with their counterparts from across the state and learn more about the student organization as part of the annual Fall Leadership Conference held November 4-7 in Albany. Students and faculty from both the Charles H. Bohlen, Jr Technical Center and the Howard G. Sackett Technical Center attended the event. The conference included a tour of the New York State Capital Building in Albany and taking part in team building activities meant to enhance their role as leaders within their respective chapters. “I thought it was a really good experience,” says Sierra Sustice, a junior from Watertown High School who is enrolled in the Veterinary Practices program. She states that she gained tips on how to be a better public speaker, which has helped in her classes. Kimberleigh DaSilva, a junior from Lyme Central enrolled in the Culinary Arts Cooking program says the conference taught her the importance of self-confidence when assuming a leadership role within an organization. “If you are not self-confident, how can you be a leader to others.” Kimberleigh added she really enjoyed one of the guest speakers at the Leadership Conference and learning how to better serve the community. Two seniors from the Sackett Center in Glenfield attended. Aimee Craddock of South Lewis and Kristian Papineau of Lowville Academy are both enrolled in the Visual Communications program and also serve as officers for their chapter of SkillsUSA. This marked the first time they attended the conference and both were excited to recall their positive experiences. “We took part in a couple of different games to learn better leadership skills and team building,” says Aimee, who also stated she made many new friends at the conference and remains in contact with them. To learn more about the SkillsUSA program and the chapters within Jefferson-Lewis BOCES, please click here.